Status: Rare regular spring visitor statewide. Locally uncommon regular breeder central. Rare casual summer visitor west, south, southeast. Rare regular fall migrant statewide. Documentation: Specimen: UNSM ZM17034, 9 Sep 1991 North Platte, Lincoln Co.
Changes Since 2000: Expansion of the breeding range into Nebraska has been slow; breeding locations have increased in number, although some are short-lived. Migrants are reported more often statewide, especially in fall, reflecting increasing numbers in Kansas and elsewhere; there is a noted northward post-breeding dispersal in that state (Thompson et al 2011). There is an earlier report 9 Apr 2012 North Platte. There are few reports of spring migrants, especially in the northeast, but they are increasing, however; 13 of the 26 overall reports are since 2000. Immature non-breeders may wander north of the breeding range in spring; singles were in northeast Cherry Co 17 May 2018 and at Gordon, Sheridan Co 27 May 2018. Summer: Mississippi Kites were first noted in Ogallala, Keith Co 27 Jul 1991 (Rosche 1994, Brown et al 1996). The first confirmed nesting there was 6 Aug 1994, when 11 birds were counted overhead and two nests were found (Dinsmore and Silcock 1995). A report “without details” of two nests found there 15 Jul 1994 (Grzybowski 1994, Mollhoff 2016) used an incorrect date. Local residents stated that the birds had been in the area for the past several years (Dinsmore and Silcock 1995). The Ogallala population has increased since the 1990s; 17 were seen late Aug 2005, and as many as 36, some possibly migrants, were overhead 11 Sep 2012. The year 2010 was a “very productive year” when a minimum of five nests produced young; four nests possessed juveniles 29 Aug. In 2011 a minimum of eight nests, along with non-breeding immatures and possible migrants, would have accounted for the 34 seen overhead 2 Sep (Jim Ochsner, pers. comm.). Although there are several reports of summering birds present for multiple years at certain locations, the only other locations where breeding has been confirmed are Red Cloud, Webster Co, North Platte, Lincoln Co, and Scottsbluff, Scotts Bluff Co.
A pair successfully raised a chick in Red Cloud in 2004; adults returned in 2005 and 2006, but this site appears to have been abandoned. 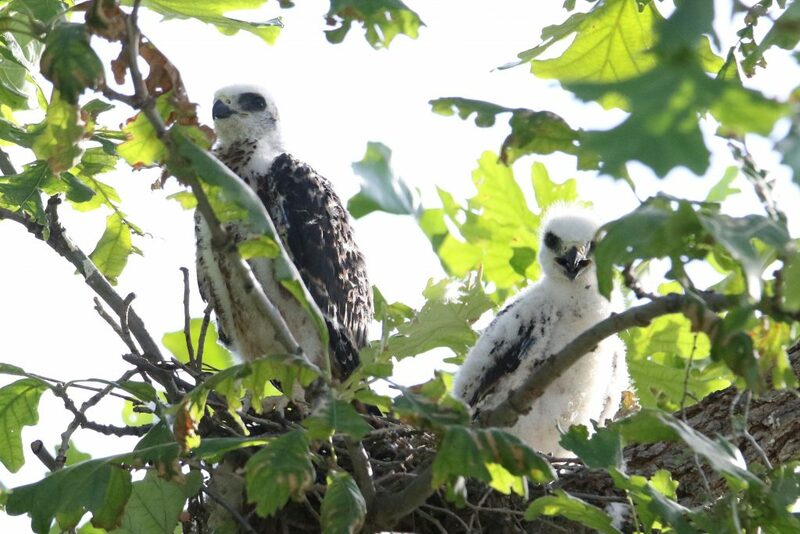 Successful breeding has occurred at North Platte beginning 2012, when a chick was raised to fledging stage but died 29 Aug. Two nests in 2013 had fledglings, but storms blew the young out of the nests; the young were taken to Raptor Recovery. Two nests were found in 2014, but outcomes were not reported. Three were at Centennial Park, North Platte 26-27 Aug 2015, suggesting breeding there, and three were in North Platte 31 May-3 Jul 2017 including a juvenile 3 Jul. At least 13 were present 30 Jun 2018, nestlings were photographed 10 Jul, and a fledgling 4 Aug.
At least one pair was present and observed copulating and seven nests were located in Scottsbluff, Scotts Bluff Co in 2011. Additional locations where birds have been present during the summer and breeding was suspected, but not yet confirmed, are Imperial, Chase Co, Benkelman, Dundy Co, McCook, Red Willow Co, and Kearney, Buffalo Co.
A pair was at Imperial from early Jul in 2011; on 17 Aug 2013, adults there “looked to be feeding young”, and 1-3 were present 28 Jun-12 Jul 2016, three were over Imperial 9 Jun 2017 and seven, six adults and an immature, were counted there 27 Jun 2018. There were as many as seven at Benkelman, Dundy Co 3-23 Aug 2010; local residents said the birds had been present “a few years” and there have been sightings of 2-3 birds through 2017. At McCook three were present all summer through at least 28 Jul 2012 although no nest was found, and 3-4 were present in 2017 and, while two large nests were found, they were not conclusively identified as of this species. At Kearney, up to four were seen near 27th St and First Ave 10 Jun-6 Jul 2016, including one “plucking leaves” 12 Jun. For a period in the 1980s breeding may have occurred in Polk Co; there were reports 1983-1990, and immatures were present for “over a week” there 3-4 Sep 1983. Recent reports from the Douglas Co area are suggestive of incipient nesting: two birds, an immature and “possible adult” were at Neale Woods 26 Jun 2015. Another pair was seen in 2016 around 122nd and Center in Omaha 10-13 May, 16 Jul, and 29 Aug; an adult and a juvenile were seen perched together on the latter date (Rick Schmid, personal communication). No nest was found, but the timing and presence of an adult and juvenile together are suggestive of breeding; early dates for fall migrants are 10-16 Aug. In 2017, 1-2 were in a different Omaha neighborhood 8-9 May. Recent reports elsewhere are of one seen briefly near Brownville, Nemaha Co 20 May 2017, and Mollhoff (2016) shows a “Probable” nesting report near Steele City, Jefferson Co. Singles were seen overhead at two locations within two miles of each other in Lincoln, Lancaster Co 11 and 29 May 2018. There are at least 13 additional reports Jun-Jul statewide; since breeding takes place from late May through early Sep, these reports are probably of non-breeding immatures. 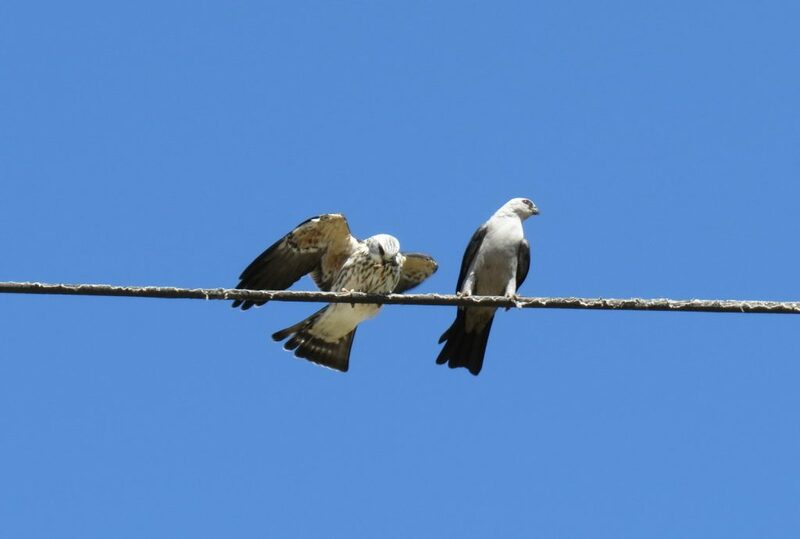 Adult and eyas Mississippi Kite at a nest in North Platte, Lincoln Co 15 Jul 2018. Photo by Boni Edwards. Dates shown are away from known breeding or summering sites. In 2011 there were reports of about 27 birds away from Ogallala, scattered statewide, 27 Aug-13 Sep, including 12 at a roost in McCook 10 Sep and three record late near Genoa 1 Oct. The hawk watch at Hitchcock Nature Center in Pottawattamie Co, Iowa, in the Missouri River Valley, has shown in recent years that there can be a significant movement southward in fall; 38 were counted there in 2000. Comments: There is a specimen SUI 14584 in the University of Iowa Talbot Collection taken in Knox Co in 1885; no specific date was given, however. Mississippi Kite eyases at a nest in North Platte, Lincoln Co 24 Jul 2018. Photo by Boni Edwards. Dinsmore, S.J., and W.R. Silcock. 1995. 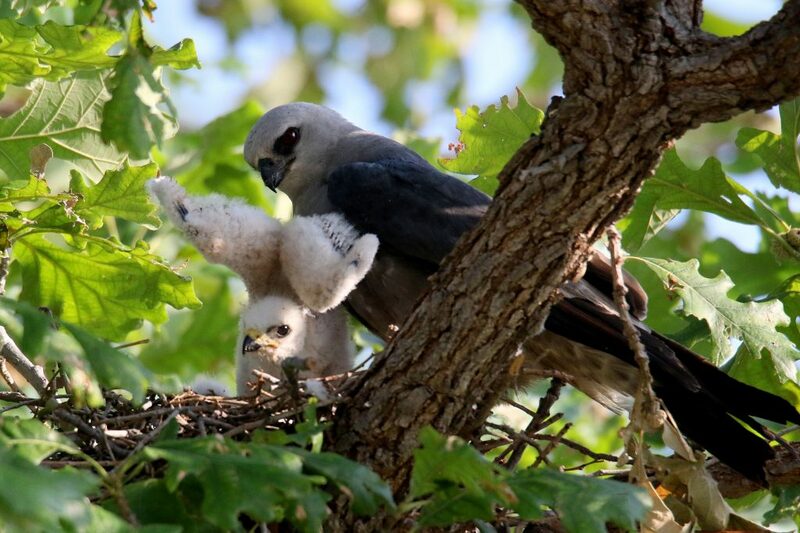 First nesting records for Mississippi Kite in Nebraska. NBR 63: 88-89. Grzybowski, J.A. 1994. Southern Great Plains Region. American Birds 48: 958-959. Adult (right) and juvenile Mississippi Kites in Ogallala, Keith Co 24 Aug 2014. The photo was taken immediately after the juvenile was delivered a food item by the adult. Photo by Joel G. Jorgensen.